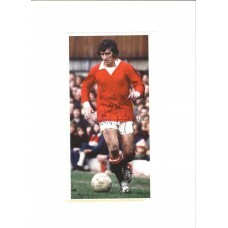 Signed picture of Manchester United footballer Ian Storey-Moore. Home » Signed pictures » Signed picture of Manchester United footballer Ian Storey-Moore. This is a large postcard size colour full length action picture of former Manchester United footballer Ian Storey-Moore. The picture is from the Manchester United player by player football book and has a really good example of a hand signed Ian Storey-Moore autograph in black ink. Ian Storey-Moore played for United 43 times between 1971 and 1974, scoring 12 goals. Ian Storey-Moore won only one full cap for England.